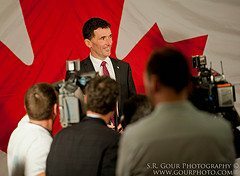 In which contributing editor Mark Bourrie ponders Paul Dewar’s chances — and what it would take to pull off a win. 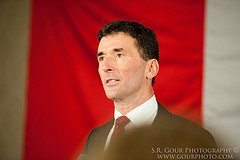 Paul Dewar wants to be leader of the NDP. He might just pull it off. Last week, Dewar hooked up with popular Northern Ontario MP Charlie Angus and toured some of the most shameful real estate in Canada. He visited the Cree town of Attawapiskat, in the Hudson Bay Lowlands. The town is the closest community to Ontario’s first operational diamond mine, but the kids don’t have a decent school and some of the Cree will spend the winter in tents because of a chronic housing shortage. Skipping Remembrance Day and travelling the near north with Angus was good politics. Angus would have been a serious contender in the leadership race. He has become one of the bright lights on the Dipper front bench, wailing on Tony Clement for his pork-barrelling in Muskoka before last year’s G8 summit. Dewar will need delegate support from northern Ontario, the big trade unions in southern Ontario, and help from western NDPers if he’s to cut himself out of the pack of nine candidates currently vying for Layton’s job. He’s also building support among urban Dippers, the kind of people who run non-government agencies and spend their days building their own political networks. 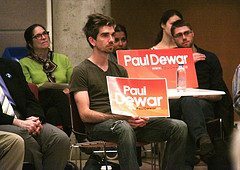 Dewar’s got the endorsement of 10 former staffers of Rights & Democracy, an organization that was torn apart when Stephen Harper appointed Tory partisans to the supposed arms-length agency. Three groups that received grants Rights & Democracy support were, the Tories claim, anti-Israel. Just after a nasty board meeting last year, Rights & Democracy’s president, Rémy Beauregard, died of a heart attack. Other ugly business followed, including purges of the board and staff, a mysterious break-in, the board’s hiring of a private investigator. More thrills and delights ensued as the mess was aired in public, with Dewar, the NDP’s foreign affairs critic carrying the ball on Parliament Hill. Whoever wins also has to juggle the Quebec factor. NDP support there is a mile wide and an inch deep. A majority of NDP MPs are from Quebec, but the membership and activist base is small and limited to Montreal, where NDP power rests in the hands of sullen and unpleasant Thomas Mulcair. In his own leadership campaign, Mulcair dangles these seats in front of his party with the tacit threat that he’s the only candidate who can possibly deliver them again. But to buy Mulcair and the Quebec dream, the Dippers had to remake themselves into a Bloc Québécois Lite, which wasn’t hard for the kind of angry lefties who adopt every cause for fashion’s sake, but was tricky for Dippers in the rest of the country. Dewar has gone after the NDPers who, though very happy with the Quebec student MPs, still see their party as a national one, with strong roots among western farmers and people who get dirty when they work. These are people who don’t want to see Quebec go. They’re Tommy Douglas socialists who see a strong role for the state, but who are also proud that Prairie NDP provincial governments balance their budgets. Dewer’s pitch to the west is a job strategy that encourages the processing of Canadian resources like oil and logs in Canada. The westerners seem to like this. He’s not threatening their prosperity with talk of ending oil and timer exploitation, which sets him apart from the NDP’s environmentalist faction. It’s hard to say. Nine candidates splitting the delegate vote can make for interesting shifts of loyalty. And a lot can happen at next March’s convention, once folks start counting the marbles, making deals, and looking seriously at the candidates. They won’t elect a new Jack Layton. But they may find a leader who can build a coalition that can replace the Liberals. And that leader could be Paul Dewar.